Originated in the Andhra Pradesh region of South India and is considered as one of the finest dessert mangos in the country. The fruit are large, averaging 14 to 16 oz. They are oblique-oblong. 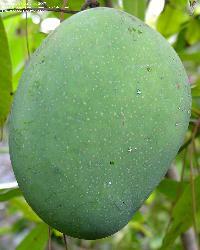 The skin color is green, even when ripe, and is overlaid with characteristic corky dots covering the fruit surface. As with most other fine dessert mangos of India, Alampur Baneshan is best harvested hard-green and ripened at room temperature. In this manner one can expect an exceptional, multi-leveled flavor, from the deep and resinous to the intensely sweet. This is a mango for the true connoisseur, not the beginner, as its flavor could prove to be overpowering to the unaccustomed palate. The fruit are uncommon outside of India and due to its green skin color, yield limitations and propensity for pre-harvest splitting, it is improbable that they will enter into international export markets. 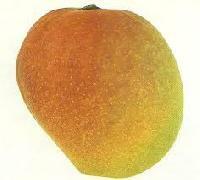 Alphonse, often termed Alphonso, is among the finest of Indian dessert mangos. Originating in Goa, Alphonse weighs 10 oz, with an ovate-oblique shape. The fruit can be green or a bright yellow depending on the environmental conditions, and they often have a pink blush on the sun-exposed shoulder. The ripening fruit are the perfect accent for the kitchen, perfuming the air with a wonderful sweet and fruity aroma. The flavor also is intensely sweet, rich and full, with multiple aromatic overtones and a hint of citrus. There is no fiber in the orange, melting flesh. Alphonse is best eaten out-of-hand, and is exported from India to specialty markets in Europe, where it is sold for a good price. The fruit are harvested firm, at the mature green stage, and are not refrigerated prior to ripening. Mature-green fruit are ripened at 70F to develop optimal flesh texture, flavor and aroma. 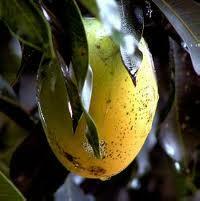 Alphonso is considered by many to be the best Indian cultivar in terms of sweetness and flavor. One of the rarest varieties and sought after - sweet large juice fruit. Beverly is an excellent late season mango. Yellow flesh is juicy, virtually fiberless, excellent! All of this adds up to a delicious mango with abundant flesh available when most cultivars are through for the year. The only downfalls are its lackluster dull green color and the trees low spreading habit. This exotic variety has extremely sweet, rich and unique taste. It is very popular in Jamaica as well as in Western India, where it is known as Pairi. To determine when to pick, look for a slight yellow color on bottom of fruit. As the name would suggest, it originated from seeds brought to the island by early immigrants from India, and the fruit and tree are similar in shape, taste and habit to the Paheri of India. The fruit range from 12 to 14 oz. and remain a deep green color even when ready to eat. When exposed to the sun they often develop a dull red shoulder. The flesh is a deep orange, melting and juicy with no hint of fiber. The flavor is rich and spicy, reminiscent of the finest of the Indian dessert types. The tree is vigorous, open growing and forms a large, handsome tree. Consistent fruiting under South Florida conditions. The fruit can be cut around the middle, twisted to separate into two halves and eaten with a spoon. 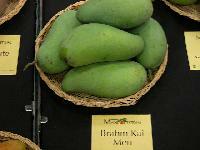 Brahm Kai Meu is a cultivar of the mango Mangifera indica, of Thai origin. Although it is relatively new in Florida, it appears to be doing very well so far, in terms of growth and yield.In Thailand, Brahm Kai Meu mango is eaten also in its green state. When ripe, Brahm Kai Meu stays relatively green with hardly any change in color. This mango is sweet and fibreless. A home garden favorite offering small tree size, disease tolerance and excellent flavor. The flavor is by far the most outstanding feature of this variety. It has absolutely no fiber; Is extremely rich in flavor, sweet, aromatic and a pure pleasure to eat. You will savor every mouthful! Its compact size makes it an excellent dooryard tree that requires minimal care. Both fruit and tree have little to no problem with fungus or disease. Lack of color and firmness are the only shortcomings of this superb variety. To determine where to pick, look for a subtle yellow color at its base. Do not let the fruit drop from a tree, or it will bruise since its completely fiberless. Many people agree that this is the best tasting mango in existence! Mango Cogshall (Semi-Dwarf) is one the best variety for indoor potting culture! 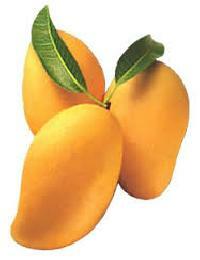 This variety is perfect for small yards or as condo mango - an ultra compact grower. It has slow growth habit which makes it very easy to control its size with pruning. The tree is suitable for container growing on a balcony, or planting in a suburban backyard. It can easily be maintained at just eight feet tall, and it will still produce a good size crop year after year.The fruit is very colorful and has a mild, sweet flavor that appeals to many. It is also fungus resistant. Selected on Pine Island, Florida in the 1940s, is recognized for its small tree size, heavy production, eating quality and beauty. 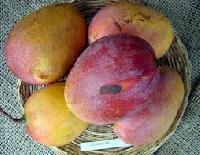 The fruit, averaging about a pound, have eye-catching yellowish-orange skin, overlaid with a brilliant crimson blush. The soft, completely fiberless flesh is aromatic, with a rich, spicy flavor that is sure to please. Both fruit and tree have good disease tolerance. The fruit ripen like jewels, a few each day, over an extended season from mid June through July. The Cogshall tree remains compact; with minimal pruning it can be maintained at a height and spread of six feet or less while producing 30 to 50 pounds (3 to 5 boxes) of fruit. Cushman is an excellent mid to late season mango that resembles a grapefruit in size, shape, and color. The flesh is smooth, creamy, and completely fiberless. Although the tree is not the most aesthetically pleasing due to poor disease resistance, one bite will make you drop the axe. One of the best tasting fruit!